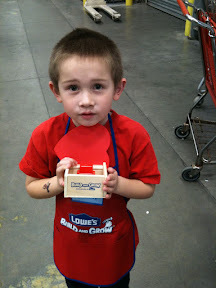 We enjoyed a special Valentine’s Day-themed Build and Grow project at Lowe’s last Saturday! They had asked for them for Christmas, but I’m glad we waited till now, I think that Valentine Puppy sure is cute! I’d backed off significant gifts for Valentine’s Day over the past couple years, but I’d kept these Pillow Pets in the back of my mind this year. They’re about $20 each. I found the Valentine’s ones at Walgreen’s. You wouldn’t think of it, but you can whip together a pretty nice Valentine’s Day experience at your local drugstore. I also found some M&Ms Star Wars gifts…$5 per kid. The lightsaber on the left in the bottom pic has LED lights, you press a button and it stays on for about a minute. More M&Ms stuffed into the handle of that toy.